We have learned about single dimensional arrays in the previous section. C# also supports multi-dimensional arrays. A multi-dimensional array is a two dimensional series like rows and columns. 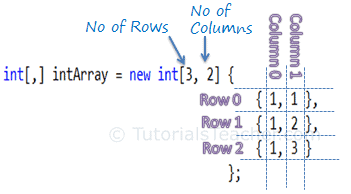 As you can see in the above example, multi dimensional array is initialized by giving size of rows and columns. [3,2] specifies that array can include 3 rows and 2 columns. The values of a multi-dimensional array can be accessed using two indexes. The first index is for the row and the second index is for the column. Both the indexes start from zero. In the above example, intArray[2,1] returns 6. Here, 2 means the third row and 1 means the second column (rows and columns starts with zero index).